Winter is your lawn’s least favorite season. During this time of year, frosts can bite at your well-maintained grass and plants, hail can batter them, and snow can crush them under its weight and cause soil compaction, as well as potentially trapping moisture and heat in the grass below it which can lead to lawn diseases such as Snow Mold. Find out how to avoid these potential winter disasters using the guide to winter lawn protection below. Wrap Up Trees – Trees can suffer in the winter, particularly in very cold temperatures. While cold temperatures cause growing wood to go dormant in self-defense, sunlight on trees in winter can cause the wood to emerge from dormancy, which can kill parts of the wood when the sunlight is replaced by shadow later in the day. To protect your trees, you can wrap the bark in cling wrap or burlap fabric to better regulate their temperature. Rake Leaves – Raking up the leaves that make their way down to your lawn during fall and winter can solve a couple of potential winter problems. Leaf cover during winter keeps sunlight off your lawn, which, in combination with the cold temperatures, encourages moss and lichens to grow where grass should. In addition, fallen leaves can trap heat and moisture underneath snow, leading to a fungal lawn disease known as “Snow Mold,” while removing them keeps your lawn drier and healthier. Mow Less in Fall – Though you’ve probably gotten into the habit of mowing over the summer, by the time fall comes around you should start letting your grass grow out. Longer grass helps to protect the base of the grass from frost, keeping it growing strong without covering it entirely and thereby inviting lawn disease. 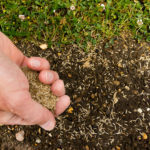 Aerate in Fall – Autumn aeration relieves your soil from the compaction it may have undergone during the summer when everyone was out and about in the warm weather, allowing for better water drainage. Keeping soil from becoming waterlogged in winter will help you avoid damaging the roots of your grass. Knock Down Snow – If you find large amounts of snow gathering on the branches of your trees and shrubs and weighing them down, do your lawn a favor and go outside with a broom to (gently) knock off the excess. Heavy snow can cause a strain on branches and even break them if it is allowed to build up too much.